After you’ve created your IT Strategy proposal, the next step is to communicate that strategy with your stakeholders. These stakeholders will range from internal leaders, such as the CEO or department Directors, to external parties such as vendors, contractors, etc. Each of these stakeholders will want, and need, a different communications strategy. You will need to brainstorm who your stakeholders are and then work with your stakeholders to determine the appropriate communications plan. The first step, of course, is determining who your stakeholders are. The answer to this will depend on several variables such as the size of your organization, your organizational structure, your organizational culture, the size and scope of your project, etc. Key stakeholders that require communication regarding the purpose, impact, and expectations of your strategy may include: the CEO, the Operations Manager, the Finance Manager, the R&D Manager, the Production Manager, the Human Resources Manager, the firm’s employees as a group, the firm’s existing suppliers, the new suppliers that will be involved in the strategy, and perhaps even the local community wherein the firm operates. Will this strategy require a significant capital investment? If so, then you may want to add the top-level Financial manager to your list. If the costs are modest, then you may be able to add a Director-level to the list instead. I generally recommend going to the highest position that will be affected, and letting them decide whether to delegate, but your unique situation and organization may prompt you to do otherwise. Are there any people who will be impacted individually? If Yes, consider adding them to your list as well. Your communication plan should be designed to immediately and personally involve the internal and external stakeholders who have the most power and are most interested in the outcome of the project. You can use your communication opportunities to solicit their perspective and insight, and get their buy-in for implementing the strategy. You can anticipate that these stakeholders will have many questions and I suggest that you address their questions and concerns honestly and candidly. High Power, Low Interest (Keep Satisfied) – These are stakeholders who may hold top-level positions, but aren’t directly affected by your strategy. If your strategy doesn’t require additional staffing or directly impact the Human Resource department, for example, then the Director of HR may fall into this category. You will want to make sure that these stakeholders are satisfied with the content and frequency of your communication with them. High Power, High Interest (Manage Closely) – This quadrant will include stakeholders with top-level positions who are directly impacted, or responsible for, your strategy. For example, the CEO, CIO, or CTO may fill this role as well as other members of the executive leadership team. If your strategy requires significant capital investment, then the top-level Finance manager (CFO or Director of Finance) will likely fall into this quadrant as well. You may decide to go out of your way to proactively keep these stakeholders especially informed as to the details and implementation of your strategy. Questions and concerns that they have should be addressed promptly and candidly. 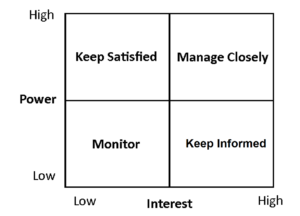 Low Power, Low Interest (Monitor) – This quadrant is reserved for people who are not impacted by, or interested in, your strategy. If a stakeholder doesn’t fall into any of the other quadrants, they will likely belong here. For example, any front-line employees of your company who are not directly impacted by your strategy. You may wish to check in with these stakeholders from time to time, via a memo or newsletter, just to keep them “in the loop” and address any concerns that they may have. Low Power, High Interest (Keep Informed) – These are stakeholders who are impacted by your strategy, but do not necessarily hold positions of authority. You may want to ensure that these stakeholders have a way of obtaining any information they need or obtaining answers to questions that they have. 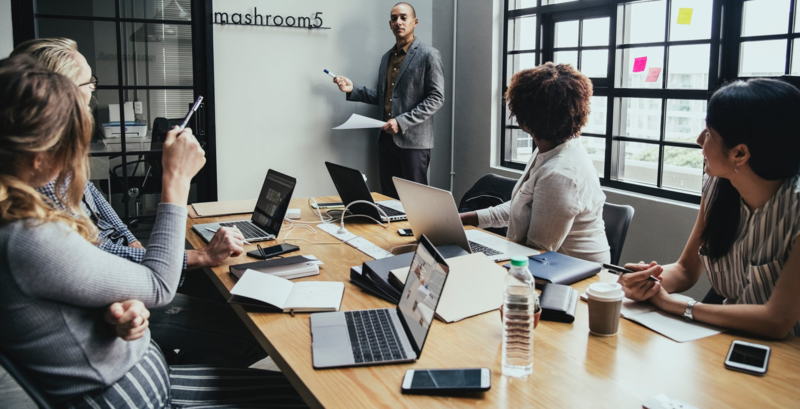 Using these communication methods will allow you to approach the stakeholders in a way (with the content and in the format) that is most appropriate for their level of power and interest in the project’s outcomes. You may choose to err on the side of caution, providing a little more information than is necessary, but your goal is to ensure that each stakeholder understands the necessity and benefits of your strategy and are confident in your ability to implement it successfully. A very basic Stakeholder Communication Matrix should include the name and title of the stakeholder, the content that the stakeholder needs or wants, and the format that the information should be presented in. If implementing your strategy involves a project, then you may also want to include the frequency of communication so that stakeholders can be appropriately updated as the implementation project progresses. Once you have determined who your stakeholders are, what their communication needs are, and created your Stakeholder Communication Matrix, you can move on to Finalizing your IT Strategy, which will be covered in Part 3: Finalizing your IT Strategy.